Standard - $67.99 Only 2 left! Some ghosts spend their time moving furniture around and terrifying people, but others take a different path. Gentlemen who died during the Victorian era spend their afterlife sipping tea from their ghostly cups and discussing the spooky happenings of the day. But if an argument happens between two spirits there is only one way to settle it, a duel. But luckily for these phantoms there is no loser in a duel since the bullet just passes through them. 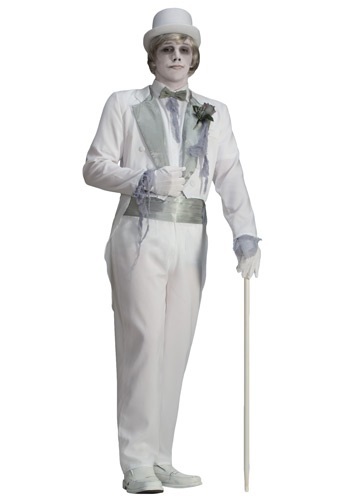 Now you can become the classiest of all ghosts in this Victorian-style costume--just add a top hat, a cane and a dead flower for a boutonniere!